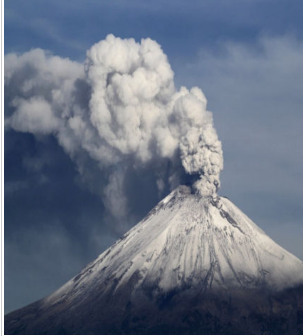 Today the Popocatepetl volcano in Mexico has erupted, throwing ash, water and gas into the air. The eruption has made an ash cloud that reaches 2,000 metres above the volcano's crate. That’s more than five times the height of the Empire State Building in New York!. A huge crater is created on top of the volcano after the first eruption blows the top of it off. People living nearby have been given advice about how to protect themselves from the ash. There are more than 3,000 volcanoes in Mexico, but only 14 are considered to be active.